The finished product. All parts glued or snapped into place. Today’s project was probably one of my more useful projects. 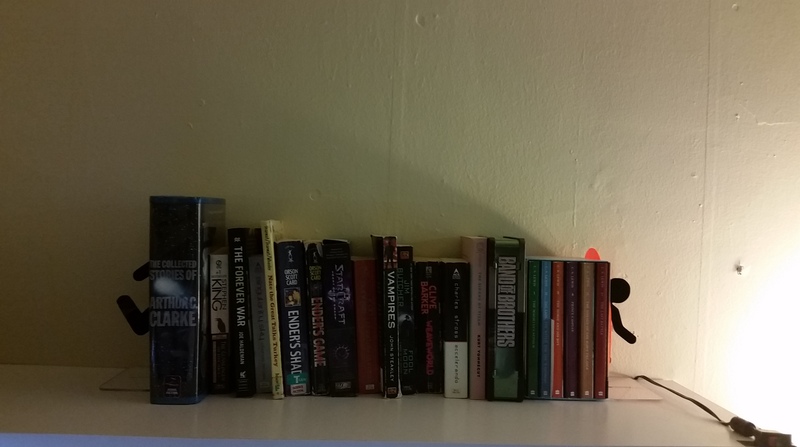 My book collection did not want to stand up on its end, so book ends were required. Not to settle with anything too simple, I decided to make them Portal themed. Now, the idea was not mine originally. 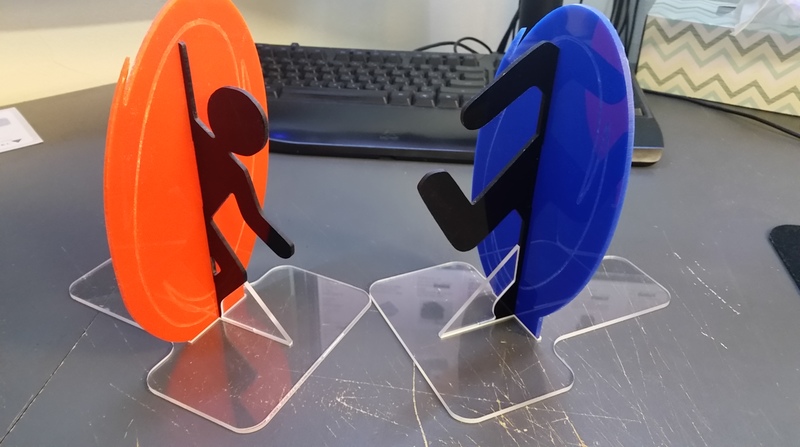 Thinkgeek (http://www.thinkgeek.com/product/e9cc/) already sells a pair of portal bookends, but why would I buy some when I could make them myself? 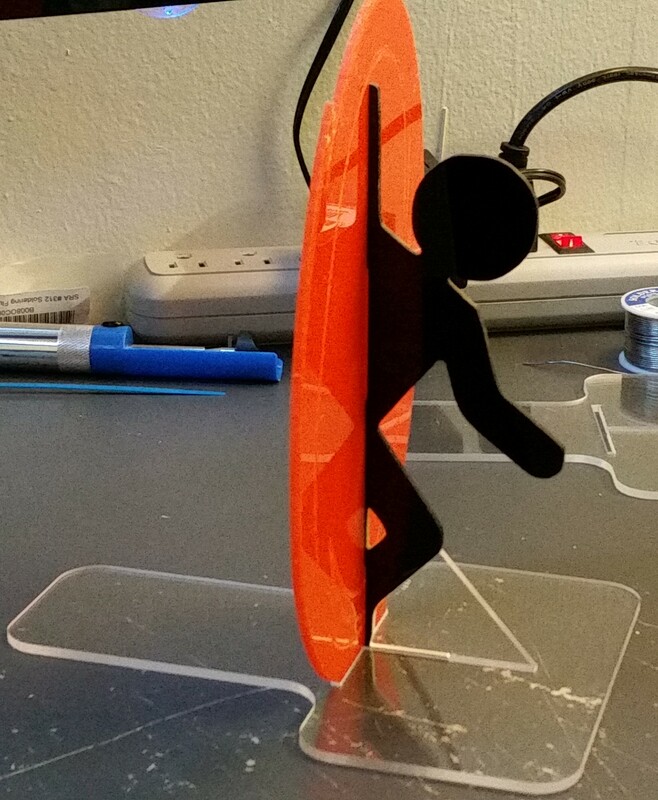 The first thing I had to do was get the portal guy outline and get that into CAD. I found a good resolution image of the portal logo which had the guy already split into halves and then used Inkscape’s “trace bitmap” feature to get paths of each half. From Inkscape I exported it as a .dxf and then opened it in SolidWorks. Once in SolidWorks, I fixed up the paths to make sure that the curves were physically cut able with my end mills. 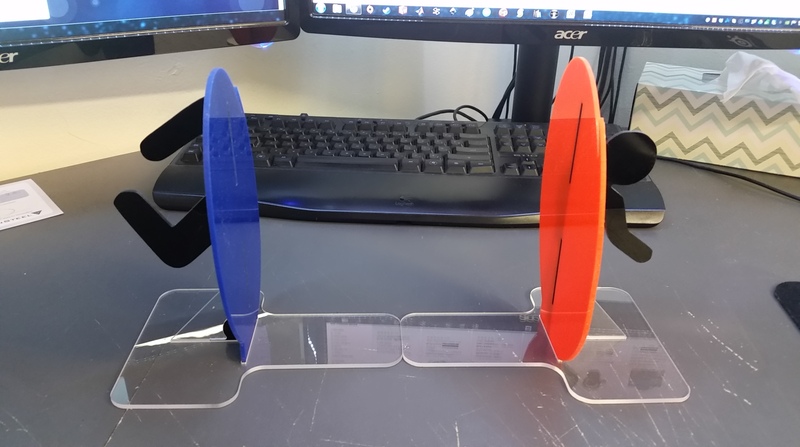 I used the same process to get the portal into SolidWorks. In SolidWorks I scaled the imported paths and added slots and tabs for attachment. 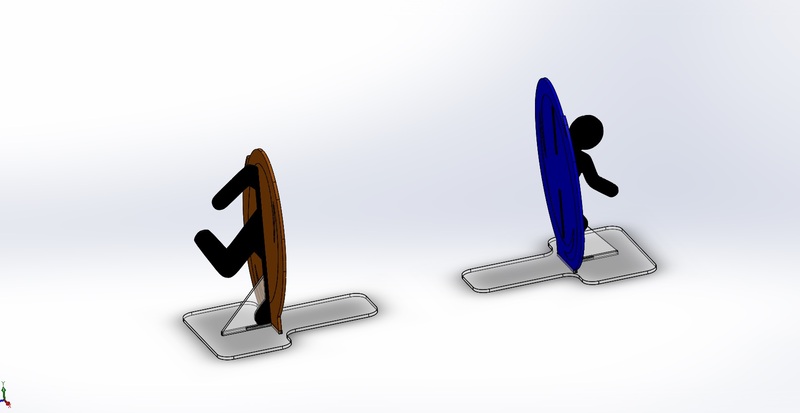 I also designed the bottom plates and traced parts of the guy outline to make supports for the uprights. 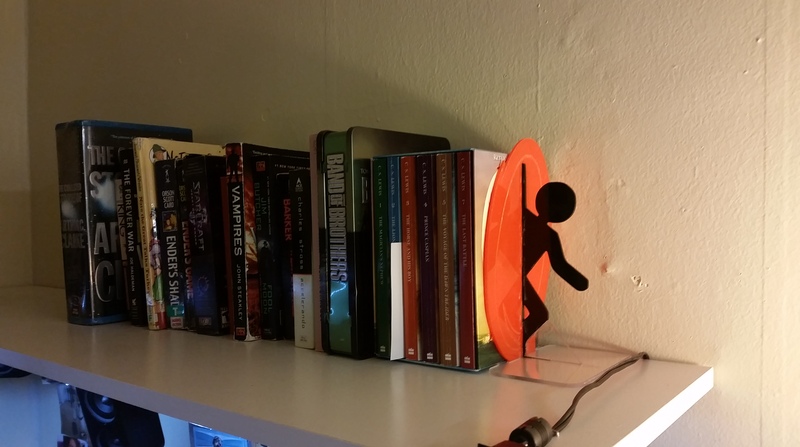 I was worried that just the outline would not make for a strong enough portal section. The guy outlines have tabs that are designed to slot into the portal and base sections. The portals and bases have corresponding slots to receive the tabs. The leg braces are the exact paths of the guy outlines, and also have tabs that insert into the base. The next step was actually cutting the parts out. 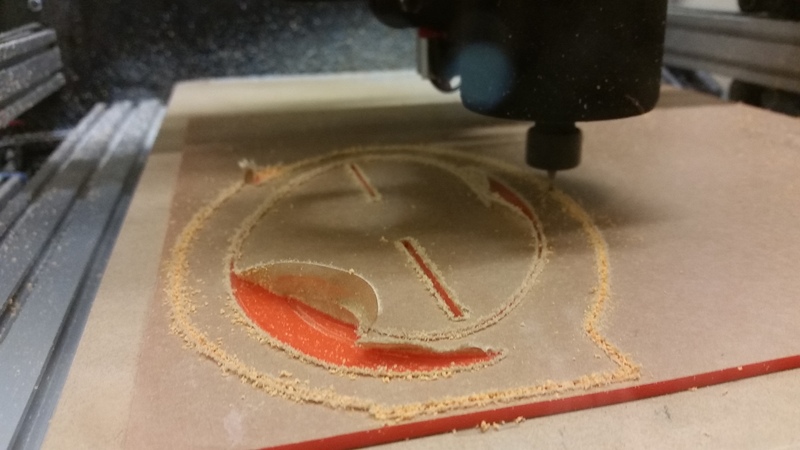 Of course I used my shapeoko 2 (which I recently/finally got up and running again!). 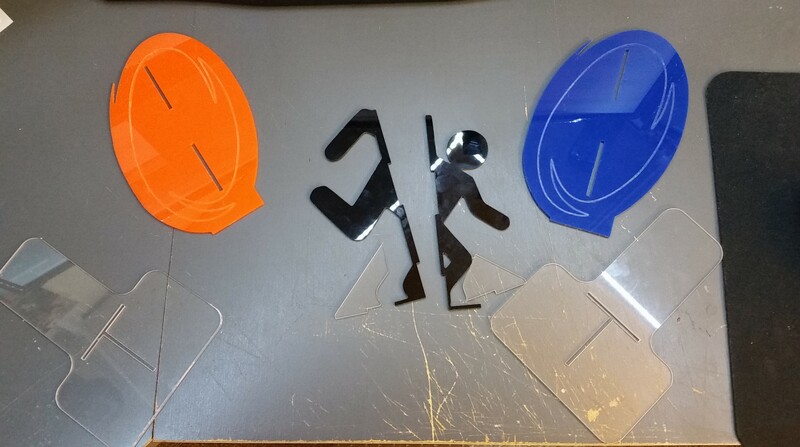 I used 1/8″ Acrylic in clear, black, orange and blue for each different part. The first part I tried to cut I ran my machine waaaay too fast. I had a feed rate of 30 inches per minute, which as I found out later, was double what I should be using. As a result of running too fast, the first part came out wrong. The slots where off and the outline was imperfect. Once I changed my milling settings, things started running very nicely. In the end the settings I used were 15 IPM with a .02″ step down per pass. My router speed controller was set at the top end of the medium range. These settings worked for every one of the parts. The milling bit I was using was a 1/16″ Square end mill. The longest cutting time was the portal pieces, taking about 25 minutes each. In progress shot of milling. Once all 8 pieces were cut out, assembly was quick and easy. I actually forgot to leave clearance on the tabs from the guy outlines into the portal pieces, but with a little force, they popped in and did NOT want to move anywhere else. All the parts of the bookends. First step was a dry fit to make sure everything fit. Spoiler: it did. After dry fit, super glue was used to make sure everything stayed in place. I did not actually use super glue on the tabs and slots because they were already so tight just with friction. The clear leg braces were edge glued to the guy outlines and then glued into the bases. Glued and ready to hold up books. I was very, very pleased how well these looked when they were done. They even work too. Speedy thing goes in, speedy thing goes out. 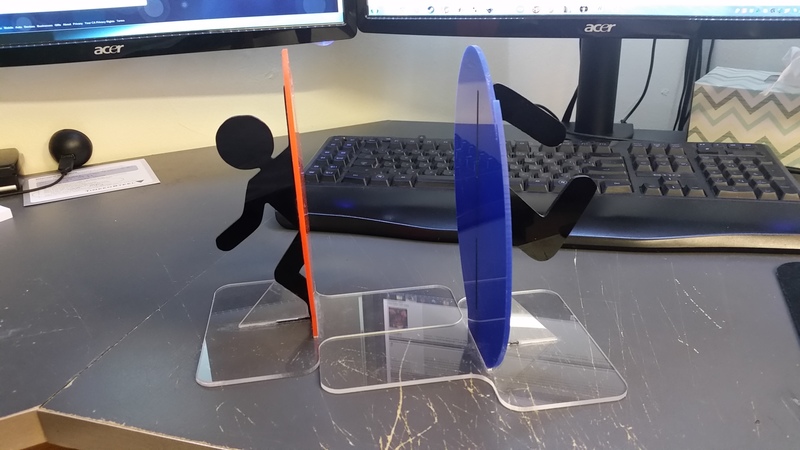 Everything is more fun with portals! Categories: CNC | Tags: CNC, Portal, Shapeoko | Permalink. Bridgeport M-Head Milling Machine, Pt. 2: First chips, VFD wiring, DRO installation and broken drawbar. Bridgeport M-Head Milling Machine, Pt. 1: New (to me) Machine!